There are several knitting, Bollywood-loving bloggers out there - Deewaani for Bollywood, Memsaab, Totally Filmi, who publishes Bollywood-inspired patterns; and Antarra, who has posted a few times on the most important and memorable theme of knitwear in Hindi cinema, the sweaters of Rishi Kapoor. There's even a Bollywood group on Ravelry, the knitting social networking (knitworking?) site. I generally find my two favorite hobbies to be almost mutually exclusive because relying on subtitles means I can't do any complicated knitting while watching Hindi films. 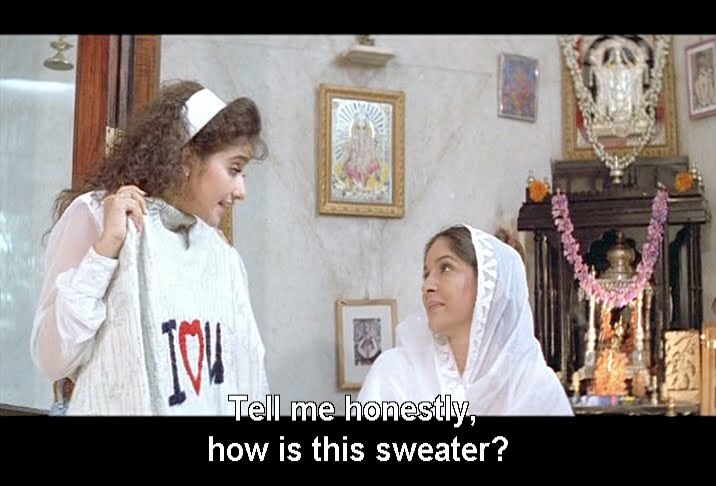 So I take my filmi fiber joy where I can find it, most commonly in scattered scenes of people knitting (Maine Pyaar Kiya, for example) and in sweaters and scarves courtesy of the wardrobe department. In addition to Rishi's Cosby years, 60s love songs set in Kashmir are excellent sources, and Black remains my absolute favorite use of knitwear in a Hindi film. In the spirit of chronicling this generally irrelevant detail - the same spirit that has brought us Bollybob's thermoses, Bollywood Food Club's balloons, and Apni East India Company's chandeliers - I thought it was high time to collect some of filmidom's finest knitted specimens using the tag knitting in fillums for my relevant posts. This particular item is not the most auspicious beginning possible, but since Manisha asks us for feedback, I couldn't resist. *swoon* Occasional series? Girl, make this a regular blog fixture! Well, at least it would fit the impeccable sense of style and the charisma of the person it was made for perfectly. Also, there is a LOT of knitting going on in Hindi films, especially in the 50s/60s. Who knew that Indian women needed to knit so much? I guess someone needed to provide the fashions for Kashmir. My most recent delightful knitting in hindi film moment is in Shatranj - Waheeda Rehman and her maa are coerced into "defecting" to China. Wahheeda's female minder wanders around knitting as she walks. The piece in question is mostly red, except in one scene when it was white, and never seems to increase in length despite the constant knitting. Other than that, we all know Rishi+knitwear = retina burn. Are you going to knit some trendy sweaters for Rishi now that he is too big to fit into his 80s ones? memsaab - knitting was a very normal, everyday thing, in the colder parts of India during winters. A lot of women used to knit (even in the 80s), probably because ready-made sweaters were expensive and not really available in a large variety, back then. In fact, most of my childhood sweaters were Mom-knitted! Thanks for all this knitting info.! I too am a knitter. I have always been profoundly touched by Akshaye Khanna going into the fire in his cottage (next to the mansion!) to retrieve the "Manavsi" scarf in Taal. I'd also like to point out that crocheting is NOT shown in the Hindi film industry. It's too low caste of a craft. Thank goodness director's have been prudent to show knitting vs. crocheting. THe Rishi Kapoor sweater of "Chandini" are so terribly garish they distract from the plot, but after seeing 3 in a row, I was so excited to see the next sweater. Also remember how she Salmaan was busy proving his worthiness and manhood working at the quarry in "Maine Pyaar Kiya" how his love knit him a sweater? More knitting posts Beth! hey, im a fellow bollywhater, ravelrer and i have a blog too. but its in spanish. Feel free to check it! Yay for knitting and Bollywood! That was one of the main reasons I wanted to learn Hindi - so I could knit while watching Bollywood movies. I think I'm getting better at knitting without looking than I am at watching the movies without reading subtitles, though. Now I have to go check out that Ravelry Bollywood knitting group. I see there's a Bollywood group AND a knitting-while-reading subtitles group!